Stars Take Longer to Form, Need "Kick-Start"
NRAO Home > Press Releases > Stars Take Longer to Form, Need "Kick-Start"
Star formation is a longer process than previously thought, and is heavily dependent on outside events, such as supernova explosions, to trigger it, a team of astronomers has concluded. The scientists reached their conclusions after making a detailed study of a number of the dark gas clouds in which new stars are formed. "Our observations indicate that we need to drastically revise our ideas about the very early stages of star formation," said Claire Chandler, an astronomer at the National Radio Astronomy Observatory (NRAO) in Socorro, New Mexico. Chandler, who worked with John Richer and Anja Visser at the Mullard Radio Astronomy Observatory in the United Kingdom, presented the results at the American Astronomical Society's meeting in Washington, D.C. 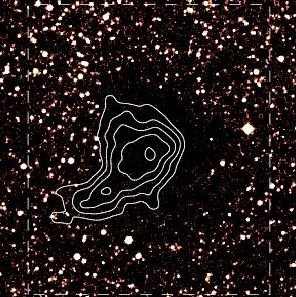 The astronomers observed the gas clouds with the SCUBA camera on the James Clerk Maxwell Telescope on Mauna Kea, Hawaii. This instrument is sensitive to submillimeter-wavelength radiation, which lies between radio waves and infrared waves in the electromagnetic spectrum. They studied clouds that previously had been observed with optical and infrared telescopes. The SCUBA images allowed them to see aspects of the clouds not visible at other wavelengths. Some young "protostars" are so deeply embedded in their parent gas clouds that they are invisible to infrared telescopes, while others have become visible by consuming and blowing away much of their surrounding clouds. Earlier studies had indicated that the "invisible" stars are only about one-tenth as common as those visible to infrared telescopes. "What we see in our study, however, is equal numbers of both types," said Chandler, who added, "This means that both stages probably have about the same lifetime -- roughly 200,000 years each." Another conclusion coming from the study is that star formation is heavily dependent on a triggering event to get it started. Such a triggering event might be the shock wave from a supernova explosion that causes gas clouds to begin the gravitational collapse that ultimately results in a new star. Another challenge to traditional wisdom about the early stages of star formation came in the team's analysis of data on starless cores -- gas clouds that have not yet begun their collapse into stars. The astronomers found that the starless cores in their study are on the verge of collapsing, and probably have shorter lifetimes than previously thought. "This means that, contrary to what we thought before, you don't need strong magnetic fields to hold these things up against gravitational collapse, because they don't last that long," Chandler said. Much theoretical work on early star formation that focuses on the role of magnetic fields may need revision, the study indicates.